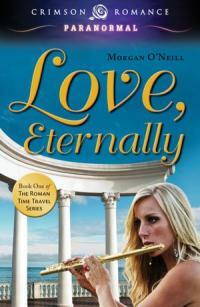 Love, Eternally is next up in my Book Review blog series! To be clear, I will be reviewing books by other publishers (not just Crimson), including young adult books. But over this summer I've read some fantastic books from new publisher Crimson Romance and want to share them with you! LOVE, ETERNALLY is an enthralling tale of power, love and destiny that transcends time. A witch’s curse takes the reader back to Ancient Rome where a 21st century flutist meets her destiny in a Roman warrior turned powerful senator, during a time of violent upheaval. The setting was authentic and thrilling, and I felt like I was there beside Gigi and Magnus step-by-step through perilous danger, heartache, and ultimately love. The authors did their research well and flawlessly integrated a love story in a historical period of great turmoil. LOVE, ETERNALLY was an amazing and exciting time-travel read that shouldn’t be missed. I highly recommend it, and I can’t wait for the second and third books in the series! If you don’t believe me about this book, believe the 11 other 5-star reviews (as of today’s date)! I’ll be reviewing the fantastic Book Two of the Roman Time Travel Series, AFTER THE FALL, in a few weeks.